Learning spaces reimagined. At Steelcase Education Solutions, we set out to do far more than simply update the classroom. Our goal was to rethink. Reinvent. Re-envision learning spaces. So we spent some time in them—hundreds of them. Listening. Observing. Talking to the people who know them best. We immersed ourselves in the way information is presented, absorbed and processed. How seats are arranged and technology is implemented. How communication and collaboration work. All so we can make learning more engaging, more empowering, more inspiring. For today, and years of tomorrows. 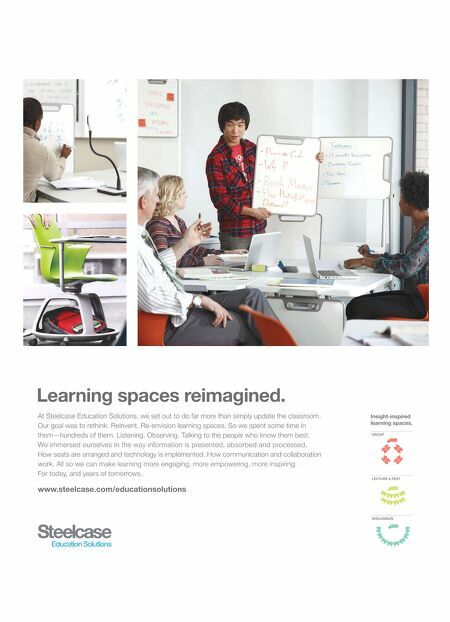 www.steelcase.com/educationsolutions Insight-inspired learning spaces.